Indraneelam-Rainbow Blue Sapphire catalyst of powerful change and a good news! Comments Intense Violet Blue Indraneelam, a premium quality blue sapphire from the mines of Ratnapura, Sri Lanka, known for having given the world some of its best sapphires! The gem has been set in silver to form a stunning talismanic ring. The depth of the blue sapphire and the intense color engages attention. There is a large possibility of getting mesmerized and contemplating whether a miniature cosmos dwells within this lustrous gem! And you cannot help but note the allure possessed by it due to its exceptional lustre. Blue sapphire harnesses the energies of Saturn – the task master among the planets. Highly misunderstood and feared, Saturn guides a person on to the path of honesty and correctness, becoming courageous and without shying from pain/ and suffering. There’s a cost attached to everything and when you get the math right, do you really begin to live. 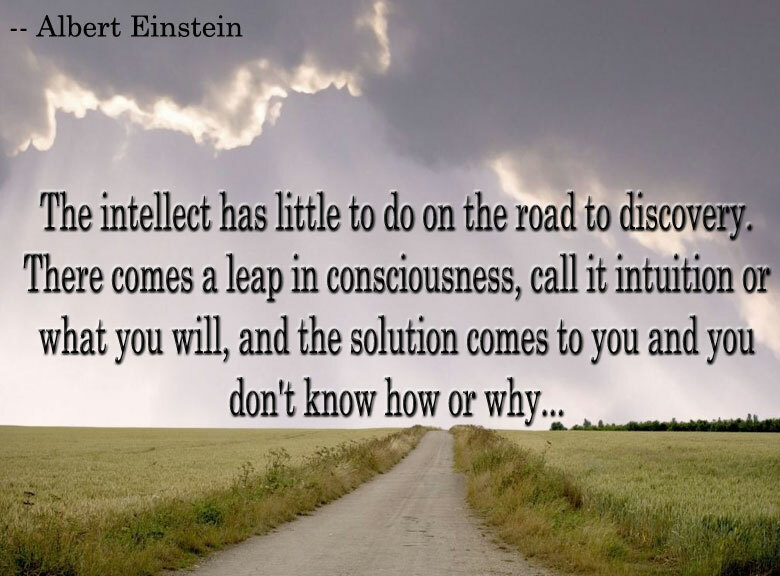 Saturn if placed well in an individual’s chart can give stupendous success. Don’t miss out on the possibility, out of fears or misconceptions! Embrace the wholeness of life! 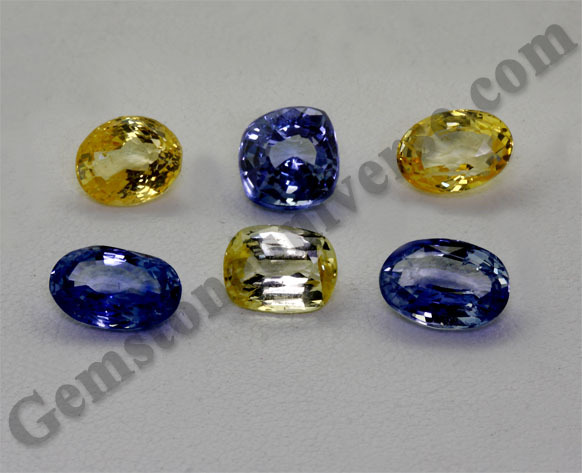 Very small lot of unheated fully natural Sapphires will be made available to you dear patrons. 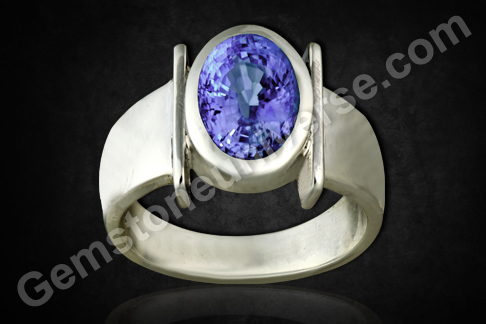 This news is a part of this blog post because the color and the clarity level of the Blue Sapphires is similar to the Blue Sapphire featured in the video of this ring above. These are entry level Jyotish Quality and it is our sheer commitment to the sacred planetary Gemology that we shall make them available at a price that shall delight you. Even though we have thousands of Gemstones at our buying division there are very few Gemstones that make the cut as Jyotish Quality. Jyotish Quality Gemstones have that special something that wow factors that make them instruments and catalysts of powerful and positive changes. Certification and appraisal of this small lot is complete and you shall have them in a day or two. Lot Named Vijay meaning victory, we hope that the Sapphires who choose their wearers make them victorious. Opal & Play of color! Ethiopian Soil Enters Gemstoneuniverse in form of Opals! The Opal is a fine example of showcasing nature’s infinite capacity to generate the WOW factor. The Opal stone is an amazing visual treat with brilliant colours in all hues visible in the single stone. In fact is the only gem in which all the visible colours of the spectrum can be seen. The Opal is mainly composed of Silica with about 3-10 per cent of water content. Opals formed millions of years ago when silica gel trapped between layers of host rock got hardened. The name opal is a derivative of the Greek work Opalus, which is further thought to owe its origins to the Sanskrit word Upala and Upalamani is how the Opal have been known in the ancient Indian texts. The Opal was valued highly by the ancients until towards the middle of 19th century. From the writings of Pliny the Elder, the famed Roman author, one gets to know of a particularly beautiful Opal set in a ring possessed by a Roman senator called Nonius (hence known as the Opal of Nonius), which was at that time valued at 2,000,000 sesterces. Mark Antony’s desire to have it was met with a refusal from Nonius, who fled leaving everything behind but the Opal. George F. Kunz mention’s in his seminal book, The Curious Lore of Precious Gemstones, a splendid opal by the name of Orphanus that was set in the imperial crown of the Holy Roman Empire. They say that a stone like it was never seen before and that possibly led to its gaining the name orphanus! The Opal comes in many varieties and is chiefly sourced in Australia. However, it is also found in Brazil, Honduras, Ethiopia, Japan and the US. Fire Opal is found in Mexico only. The stone is relatively soft and brittle and needs extra care in handling and a protective covering when setting it as jewellery. Since the Opal has a large amount of water, exposure to heat can result in loss of water and hence cracking of the stone or developing fracture like lines. This phenomenon is known as crazing. Opal is stored in water for the same reason. People who save it in vaults often keep it with a piece if moist cloth. The exposure of Opals to ultrasonics, steamers, heat and chemicals should be avoided. The only Opal hard enough to withstand faceting are some fire opals. Opals are usually fashioned as flat pieces or domed cabochons. Since the mineral matter is so fragile here Opal is often fashioned as doublets or triplets. This however makes a dent on its value but ensures that the Opal is safeguarded against damage to a large extent. A doublet opal is not a solid opal but is a thin slice of real opal which has ironstone/ black potch/ obsidian /basalt /glass glued to its back to give it more strength. Also a darker helps emphasize the play of color helping the stone fetch more value. 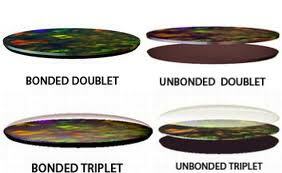 The triplet Opal is a doublet opal whose upper surface has further a transparent clear glass or quartz domed cap attached. While the base helps bring out play of color, the domed cap magnifies the opal and protects it as well. 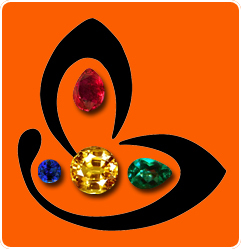 The doublet and triplet opals are good for jewellery making only and have no value in planetary gem therapy. Play of Color: It is the display of shifting spectral colors and is caused due to its internal structure where silica spheroids are arranged in a periodic patterned fashion. 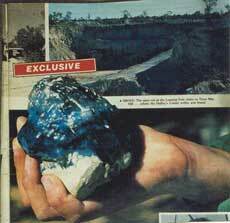 Opalescence: It is a phenomenon displayed by the milky white and blue opal. It is NOT the play of color and Play of color is NOT Opalescence! Potch: Very common. 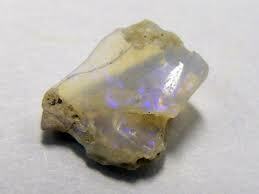 Translucent opal with hardly any play of color. Occurs in many body colours. Black Opal: It is one of the most valuable types of opal. 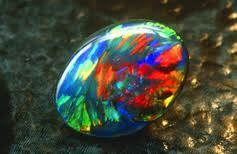 Any Opal that displays good play of color against a dark background is known as a black opal. The entire range of colours can be seen against the dark background. The ones that have a red or orange play of colour are highly valued. The opals with a greyish background color are called semi-black opals. Light Opal: Opals with a white, milky white or translucent background are called light opals. Those with low transparency and less play of color beget a lower value. On the contrary, an opal with high transparency and lots of play of color can fetch a very handsome price. These are also known as crystal opals. 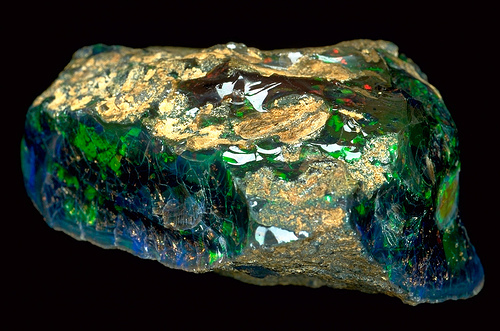 Boulder opal: in this case the opal comes naturally attached to the host rock where it was formed. It is usually cut in irregular shapes. Matrix Opal: In this variety, the silica gel formed opal by streaking across the host rock rather than forming a uniform layer. 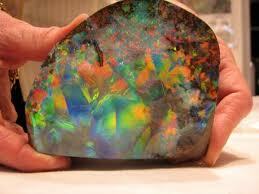 Yowah opal of Australia is an example. Fire Opal: ranging from reds, yellows and browns, it is a transparent or translucent stone with no or some play of colour. The only known source is Mexico. Opal in Planetary gem therapy is a gem for Venus, but it is prescribed in certain conditions, especially is the Venus is favourable for the individual but not placed well in the horoscope. Its planetary power is immense – the gem is capable of bestowing all material pleasures, adding charisma and improving interpersonal relationships. Young individuals are generally advised against wearing it despite benefits gained through this gem. Strange as it may sound, opal gives the wearer a taste of all luxuries and then makes the individual disinterested in it all! The mind instead gets more tuned to spirituality and god. It was presented to Queen Elizabeth II on her first visit to Australia in 1950. 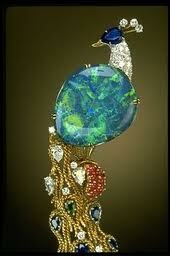 Weight of the opal is 203 carats. It is a massive and spectacular gem at 263.18 carats! The best visual example of eye of opal, a stone that gets created when mineral gel fills a cavity to form a precious stone. No wonder that the Opal was referred to as Opthalmius, by the early writers. It is the largest polished opal at 3,749 carats. Found in Brazil, now it is a part of private collection. 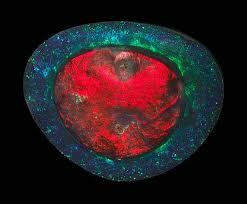 It is the largest uncut Black opal in the world, weighing 1,982.5 carats. The stunner at 2565 carats rests with the Smithsonian National Museum of Natural History. Scintillating shower of spectacular Colombian Emeralds! Fantastic variety of sizes and shapes! From 20 pointers to set as accent stones to 4 carats and above! 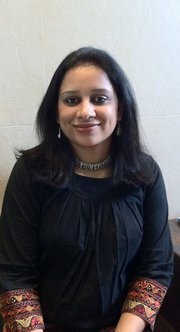 Want to understand what exactly is Jyotish Quality. Come have a look! This Colombian Emerald Lot is the embodiment of the transformative quality of rare and beautiful gemstones and a catalyst to propogate life forward! This Emerald lot is the result of our sheer commitment towards the cause of planetary gemology! 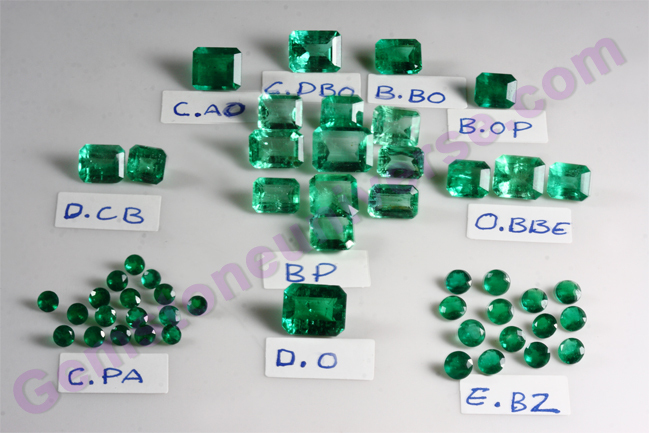 This lot of fully natural and unenhanced Emeralds from Colombia is under certification and classification and will be made available to Gemstoneuniverse patrons by June end. Each singular Emerald is a masterpiece with magnificent color ranging from spring grass green to deep rich emerald green! And each and every gemstone has over 90% clarity levels! So get ready to be delighted by the wide array of super fine Natural and unenhanced Emerald coming your way shortly! Magnificent clarity of over 90%! This is very rare for fully natural emeralds. From Cosquez and Muzo mines! Price: 1/6th of Normal Retail. If you can give us this quality even at double the price we shall buy 100+ carats from you should you have supplies. We shall ensure that the fruits of Planetary Gemology reach the individuals who need it the most. 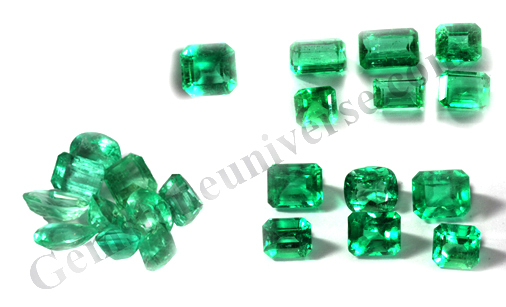 So hold your breath and await the arrival of this lot of sattvik and pure fully Natural Colombian Emeralds with powerful Jyotish energies to bestow upon you the best of the gifts of the planet of Business, Communication and Finance – Mercury! This lot has been named BONA FORTUNA 2011, which when translated from Roman means Good Fortune! With the best of the qualities of Jyotish gemstones, good fortune is what these gems promise! Up next- Peridots or Green Diamonds you decide. 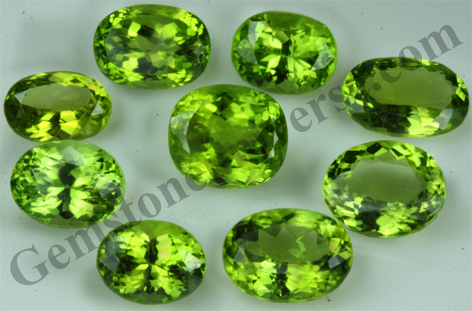 Glorious New lot of Pakistani Peridots for Gemstoneuniverse patrons! The Greeks named it the Gold Stone! Presenting Green Gold! Natural and untreated Peridots from Pakistan! Peridots are also known as the “Evening Emerald”! Statistically, Peridots give best results as an Emerald alternative! Filled with fertile powers of the planet of Business, Finance and communication – Mercury! We have named this lot ‘Peridonia – 1’, which in Greek means, “To give richness”! Sensational and scintillating Jyotish gemstones, with the most alluring color and amazing clarity! Truly delightful Natural Peridots from Pakistan! Certification for this lot is complete and you can expect them online in the Peridot inventory by June end. 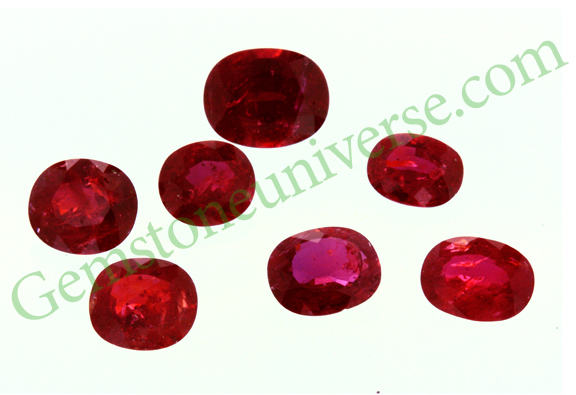 Luminous, glowing with Royal splendour and a color surpassing the famed Imperial Pigeon Blood Color-Gemstoneuniverse proudly presents new lot of unheated, eye clean of Mozambique Ruby. Have a look at these beauties dear Gemstoneuniverse patrons. 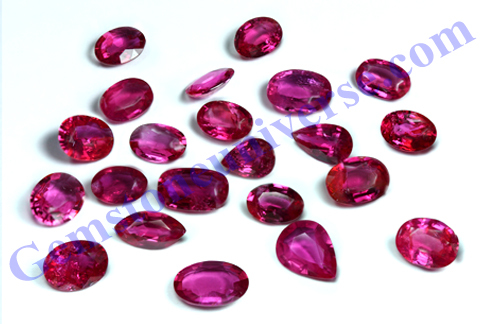 In current market conditions where unheated Ruby prices that get classified as Jyotish Quality are going through the roof we present you these glorious unheated rubies with a color so pleasing it will delight you. Each of these unheated rubies from Mozambique have above 90 percent or above clarity, they are fully natural with no heat or filling. 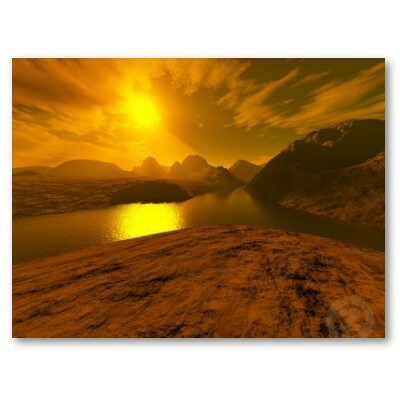 Glorious Sun energies which fits the exact description of a Padmarag. The sacred texts say that if a real genuine Ruby with a fine color is placed on a lotus bud early morning its power will make it open the bud as soon as the first ray of Sunlight strikes the ruby. Certification for this lot is complete and you can expect this lot to be listed in the last week of April or earlier. Sensational News: Get ready dear Patrons for a scintillating and fascinating Colombian Emerald Blitz. Whether you are a Gem connoisseur, a fan of planetary gemmology or a serious investor these natural treasures are going to bring you much joy and excitement. We always deliver for you dear patrons. Shortly to be uploaded is a fine lot of fully natural, un- enhanced emeralds with sensational green from Colombia. Absolutely brilliant with each emerald having a clarity level above 90% there is a gem for everybody. With some fine Emeralds having the finest green imaginable each of these fine treasures is a collectible. Yes, each single piece is a collectible and we will make them available to you that will delight you. – Color- Fine Range of color, with top quality samples having the deepest purest green with no other hue. – Range from both Muzo and coscuez Mines. Are you ready for a 5+ carats fully Natural Emerald crystal with over 90% clarity levels? Each of these treasures from Mother Nature is very special and will deliver the best results for planetary gemology purposes. 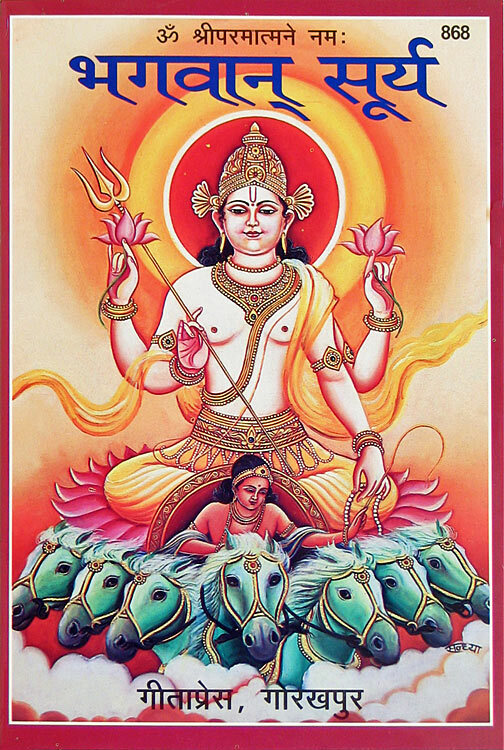 Guaranteed to harness the best of Sattvik Vedic Mercury energies these will be listed soon. Certification and appraisal is complete. Lot Name Hermes Uniqa 2011 after the Greek God Hermes. It is no surprise that it all gets connected in the end. 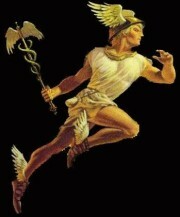 Hermes is God of Trade, Profit, Merchants and Travellers. His main festival, the Mercuralia, was celebrated on May 15 and on this day the merchants sprinkled their heads and their merchandise with water from his well near the Porta Capena. The symbols of Mercury are the caduceus (a staff with two intertwined snakes) that signify protection and a purse (a symbol of his connection with commerce). This is just a small sample from the huge lot of colorless top quality flawless white topaz also known as White Topaz ( No other shade absolutely) we have acquired from Brazil. With beauty rivalling that of Diamond what makes this lot very special is that all gems are fully natural, irradiated and unheated. 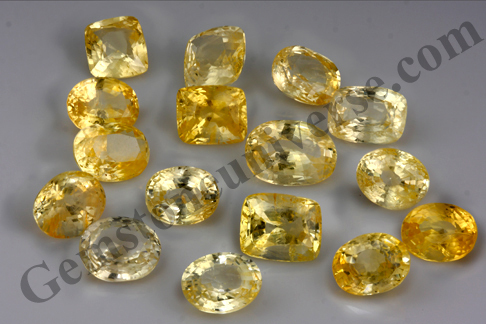 The common treatments in Topaz family are generally heat and radiation that render them useless for Jyotish purposes. On regular and consistent requests from some patrons we shall be listing them soon. 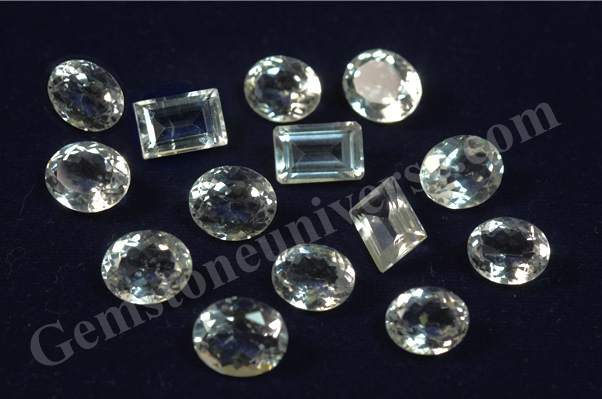 Each White topaz of this lot is eye clean, calibrated, jewellery grade and fully natural. Statistically we have found White Topaz and colorless Zircon to give better results as Diamond/White Sapphire alternatives, than American Diamond or Moissanite. The X Factor in this lot is that these look better than Diamonds. Certification and appraisal of a portion of this lot is complete and you shall have it in the alternative gemstones section before April 2nd week of earlier. Lot Name: Venus brilliance 2011. The 16 day trip to Madagascar was worthwhile when we see these beauties from the Madagascar Ruby Mines . Just 7 in number these are very special unheated well formed crystalline Rubies from the famed Vatomandry Ruby mines in the mountain region located in the rainforest covered area in the interior west of the city. 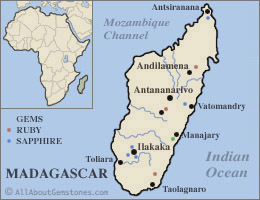 The 4th largest island of the world and a treasure trove of precious mineral wealth, Madagascar Separated from super-continent of Gondwanaland, 150 million years ago and developed its own atypical and special biodiversity besides being a treasure trove of precious mineral wealth. Representing the best grade of Vatomandry Rubies these are inspiring, very rare and having a fine color that is quite close to the imperial pigeon blood red color. To know more about the imperial Pigeon Blood color please click here. When we did get these 7-the many delays and disappointments of a 16 day sojourn were forgotten- Such is the rarity of unheated fine quality gemstones. And when we know that a Gemstoneuniverse patron would own a piece of Nature’s treasure it makes everything worthwhile. 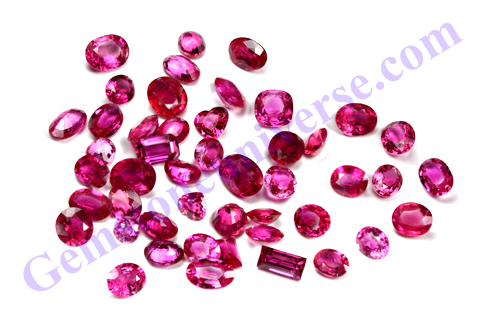 – All Rubies are Natural, Untreated, Un Enhanced. 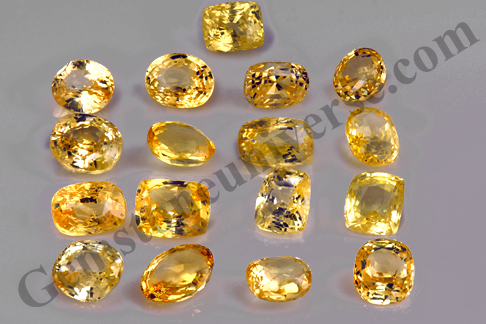 – Very good Size with the biggest one over 3+ carats. – Deep Scarlet Red Color. This Lot has been named as Syamantaka1702 after the famed and powerful Gemstone of Lord Sri Krishna. Certification and Appraisal of this lot is complete and we should have them in the online Ruby inventory in the next two weeks or earlier.